We’ve all heard the proverbial Internet faux pas when one uses the ever-infamous Comic Sans Font in one’s webpage and more often than not, the usage of such font is met with either thinly veiled amusement or downright rejection in some. Either way, this seems to tell us one thing: Fonts do matter. How did Facebook’s “F” become such a prominent logo? How did Tumblr’s “T” become such a symbolic icon? Easy, they chose their fonts wisely. In today’s time and age where there is never a shortage of fonts, using Comic Sans as a primary font online is akin to having a webpage death wish. Although primarily beneficial for web pages, font usage is pivotal in mobile app development as well. Contrary to popular belief, first impressions do matter and they usually make a lasting impact. In web design, this is key to a user or reader’s experience very much like how one perceives the cover of a book. From a website perspective, the font “frames” your content and how a viewer perceives it. Very much like how a frame holds a photo or how a book cover tries to entice readers. Website fonts make the foundation of what the website is trying to convey. Whether this may be quirky, trendy, professional or business-like, it is all down to what fonts are used in order to relay that particular impression the website wants its users to experience. Of course, not every website is the same and each and every website has a distinct personality or goal it wants to accomplish, and choosing a better font can very well help. The various types of fonts you choose from determines what kind of message you want to deliver to your users. It is very much similar to writing a letter or an essay wherein the type of font one uses gives its reader the tenor of the letter from the visual impact of the font. For one doing business and resumes, brisk formal fonts are used while for personal letters, a personal touch is given to the fonts with more artistic detail. Whether you are promoting a business brand or appealing to the public with your trendy new website, the font you choose should make a lasting effect on your users that would influence them to visit your webpage more often. This one is a no-brainer but it is not stressed enough. Fonts provide the framework of your website content. Without it, users would not be able to understand the message a particular website is relaying. This is the primary reason why alongside font design, font sizes matter. It bears stressing that a website can be so rich in content and information but will be rendered useless if fonts are used inappropriately. Fonts were primarily made in order to correctly relay a message and using one incorrectly makes its purpose self-defeating. Considering the appropriate font is only step one. In order to maximize the effectiveness of a chosen font, web designers should consider also the font size as well as the design. After all, you may have all the elements of a perfect content along with the perfect font, but it would still be useless shall it be unreadable. After selecting the appropriate font and font size, web designers should consider the interface of the website to make their contents reader and user-friendly. When all this is considered, readability would become a non-issue. If webpages could talk, they would have a lot to say but since most of them could not, written content was created instead. And contents in these web pages are formulated through the usage of very diverse fonts, each with a distinct personality. Very much like when one capitalizes every letter in chatting when one’s ire is tapped, fonts create mood and emotion. Each and every single font has a voice and by every letter and word created, the writer is telling a story using that very font’s voice. As these fonts are given voices and create moods and emotions, the very effect they have on its users also inspire the same kind of voice it is using to relay it’s message or the aura that surrounds a particular word. It is rather easy to differentiate what kinds of moods fonts are trying to relay. Let’s take the Impact Font for an example in comparison to Brush Script. Let’s say one is writing a titular provocative piece imploring users to action or perhaps announcing and promoting a new brand. Between the two, the Impact font has more persuasive value seeing as Brush Script’s style is a bit more subtle and subdued. While Impact’s mood inspires action and beckons readers through its powerful strokes, Brush Script evokes a composed and serene emotion that would befit an artistic webpage. Likewise, web designers ought to be a bit more critical and particular in selecting the fonts used for their webpage in order to be perfectly certain that they are using the correct voices and evoking the appropriate emotions as well as moods for their webpage. When a reader navigates through your website or when a user starts up your mobile application for the first time, the task can be already quite intimidating and it would be even more daunting for users and readers alike shall the navigation be clunky and complicated. This is precisely why highlighting the essentials of your webpage and your mobile application makes it easier for users to navigate through. The proper usage of font not only gives your website aesthetic value but will also provide your users and readers ease in plowing through your pages and interacting with your mobile application. It is in this way that headers are written in bold or are significantly different from the rest of the content or when hyperlinks are italicized. In simpler words, fonts provide not only ease in website navigation, they also sort out the important stuff from the rest of the content’s clutter. Web designers might take fonts for granted and consider them to be trivial to be given a more serious thought. But they have overlooked the simple fact that content makes up the bulk and the weight of most websites thereby making fonts a very valuable commodity to consider. WE have come a long way since the usage of fonts to convey messages and letters have since developed into something so much more, and that is in the promotion of businesses and giving websites a more personal feel. 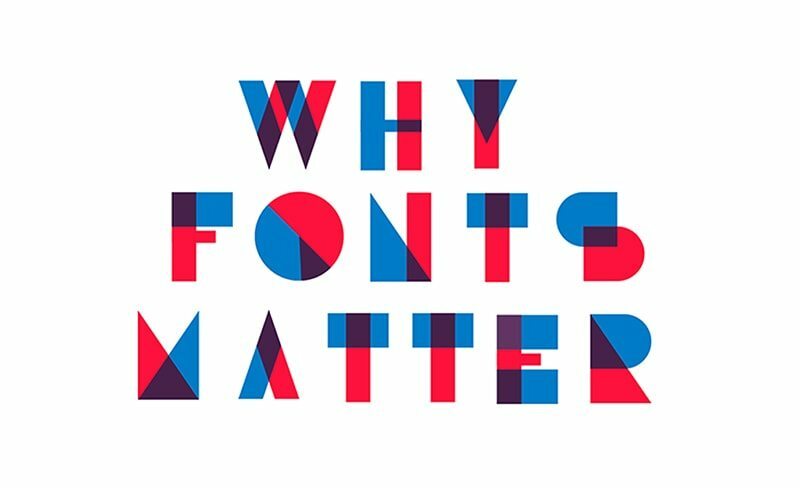 Whichever of the two it may be, it is very much indisputable that fonts have become so necessary and why they matter indeed.